Are you one of those guys that carries a wallet that’s over stuffed and is thicker than a slice of 7 layer cake? 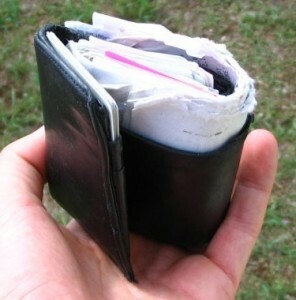 Growing up, my dad’s wallet looked like this one on a good day. My wallet was never that bad, but it had begun to get too bulky. My original desire was to make my own Tyvek wallet for camping and hiking so I could carry a less bulky wallet. But after making it, and seeing how thin and durable it was, I began to carry it every day. The one I made has been in use for almost a year, and it has worked great. Nothing says ultralight camping nut like carrying your own homemade Tyvek wallet. You certainly get some looks and comments on carrying your cash around in an envelope. Finding the Tyvek envelopes was the hardest part of this process. USPS used to have letter sized Tyvek envelopes but now they only carry a larger version which is too big for a wallet. You can purchase a box of 25 envelopes from an office , and make everyone a new wallet for a Christmas gift this year. My wallet has been used daily for the last 9 months and it has held up very well. There are signs of wear at the edges, but any leather wallet would show the same wear after 9 months. Overall, I have been very pleased with the Tyvek wallet and I’m much happier to carry a thin wallet than some bulging monstrosity of a leather wallet. What started out as a camping project has turned into an everyday carry wallet. UpaDowna.com has a review on the commercially made Mighty Wallets. The commercially available ones are made from sheets of Tyvek, not envelopes and the pockets are slightly different than a make your own. 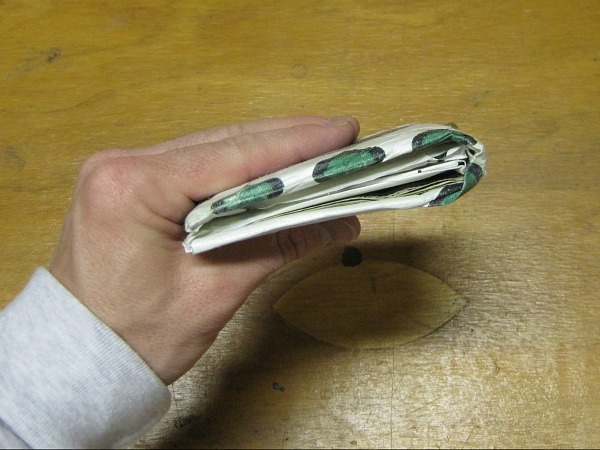 The following YouTube video shows the Mighty Wallet designer making a wallet from an envelope. Their video is much better than I could make, plus it’s already been made. Total time to make the wallet is about 10 minutes for your first one. It may be a little confusing the first time you see the video but watch it a couple of times with your envelope in hand and it makes sense. Also, when making yours, have access to the video and replay each step. For my wallets, I tested double side tape, super glue, and contact cement for the adhesive Double sided tape is by far the easiest, but contact cement held the best. That is the only modification I made to the instructions above. It’s now time to gather your materials and start working on that Tyvek wallet of your own. Hopefully you’re more artistic than me, and you can come up with some cool designs.